US stocks dipped as markets returned after the Thanksgiving holiday. A man broadcasting his own radio station from a garden shed in Hertfordshire has, after 44 years, been given a slot over the Christmas period on his local BBC radio station. His story came to light in 1974 when a TV programme showed his entire audience disappearing when his wife popped to the shops. Despite a largely absent market audience last week due to a long Thanksgiving weekend in the US, risk assets suffered significant selling pressure with only safe haven assets posting positive returns. Asset class returns in sterling and local currency are below; most notable is the significant under-performance of US equities, as well as the extending sell-off in the oil market. The declining oil price follows a string of comments from US President Donald Trump in which he has exerted pressure on Saudi Arabia to put off production cuts and keep energy prices low. This has come at a delicate time for the Saudi kingdom’s crown prince, Mohammed bin Salman, who is under extreme international pressure following the suspected assassination of journalist Jamal Khashoggi last month. As such, the energy markets have been particularly volatile, posting the largest weekly decline since 2015 on fears of oversupply in the market. Indeed since recent peaks in October, the price of West Texas Intermediate (WTI) oil has fallen nearly 35% while US energy stocks have declined just short of 20%. Though a collapsing oil price has led to setbacks in the oil & gas sector and in turn contributed to the S&P 500 closing the week in correction territory (defined as a decline of 10% from its peak), it was perhaps more significant for broader US equities that Apple, the world’s largest listed company, was at the centre of two significant news stories each with wide reaching consequences for investors. First, the company’s CEO Tim Cook gave an interview where he said “the free market is not working” and that new regulation for US technology companies is “inevitable”. With the growing threat of GDPR-like regulation in the US, social media giants like Facebook, Twitter and Snapchat are most at risk from restrictions on consumer data usage. Second, Apple was the subject of a Wall Street Journal article which reported that the company has cut production orders in recent weeks on weak demand for new iPhone models. 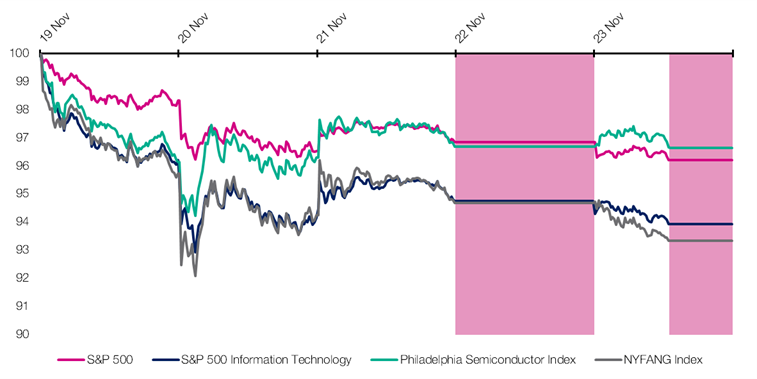 Subsequently, chipmakers and semiconductor manufacturers integral to Apple’s supply chain now facing a declining order book have become the target of waning investor sentiment. 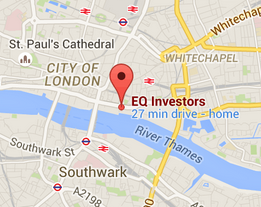 So where does this leave the US equity market going forward? Fears around the impact of tariffs on global supply chains along with warnings from the IMF and OCED that the global economy is slowing continue to pose a challenging environment for investors. Many market participants will be looking for respite at the highly-anticipated G20 summit at the end of this month, at which the US and Chinese presidents are due to talk trade. Any bilateral agreement which stems the escalation of a trade war will be extremely positive for risk assets, though many consider a breakthrough unlikely. STAT OF THE WEEK: $1 trillion – the loss in market capitalisation of five tech giants (Facebook, Apple, Amazon, Netflix and Google) since their 2018 highs (Bloomberg).